work was done. The boys helped me about the work. I wrote to Mother in the afternoon. Winnie came back before supper time. Will was at the races in the afternoon. Thursday June 5th 1890 I ironed and baked today. I began sweeping up stairs before dinner. and worked up there in the afternoon. I gave Mothers room a good cleaning up. Will was at the races and Winnie went out too with some little girls. I worked on the net in the evening. I set the incubator today. 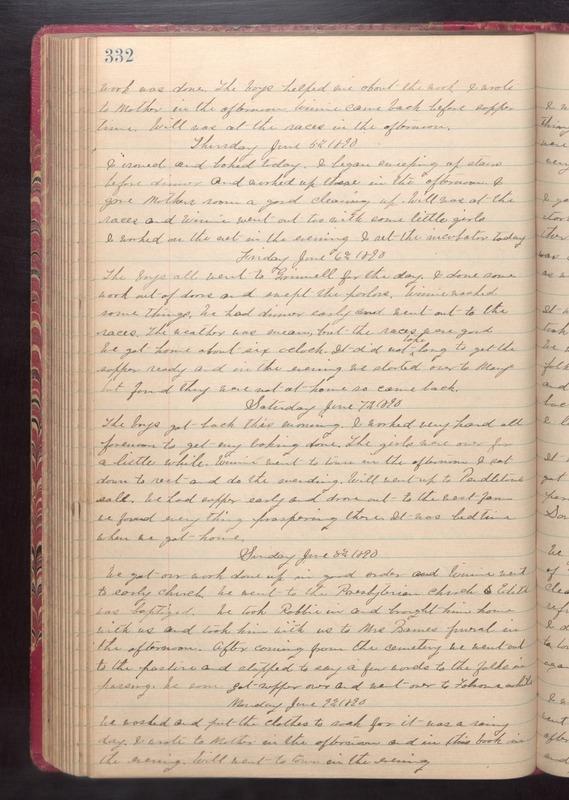 Friday June 6th 1890 The boys all went to Grinnell for the day. I done some work out of doors and swept the parlors. Winnie washed some things. We had dinner early. Went out to the races. The weather was mean, but the races were good. We got home about six oclock. It did not take long to get the supper ready and in the evening we started over to Marys but found they were not at home so came back. Saturday June 7th 1890 The boys got back this morning. I worked very hard all forenoon to get my baking done. The girls were over for a little while. Winnie went to town in the afternoon. I sat down to rest and do the mending. Will went up to Pendletons sale. We had supper early and drove out to the west farm we found every thing propering there. It was bed time when we got home. Sunday June 8th 1890 We got our work done up in good order and Winnie went to early church. We went to the Presbyterian Church. Edith was baptized. We took Robbie in and brought him home with us and took him with us to Mrs Barnes funeral in the afternoon. After coming from the cemetery we went out to the pasture and stopped to say a few works to the folks in passing. We soon got supper over and went over to Folsoms awhile. Monday June 9th 1890 We washed and put the clothes to soak for it was a rainy day. I wrote to Mother in the afternoon and in this book in the evening. Will went to town in the evening.